The best part of DFTV is completing your work around others who share the same passions as you. In the studio, people are always communicating, bouncing ideas of each other, and helping others. The atmosphere is wonderful and it makes going into university so exciting. “I chose to study at NTU as I had heard fantastic things about the University from my older brother, who had also studied and graduated here. Have you had any speakers or lecturers from industry visiting as part of your course? 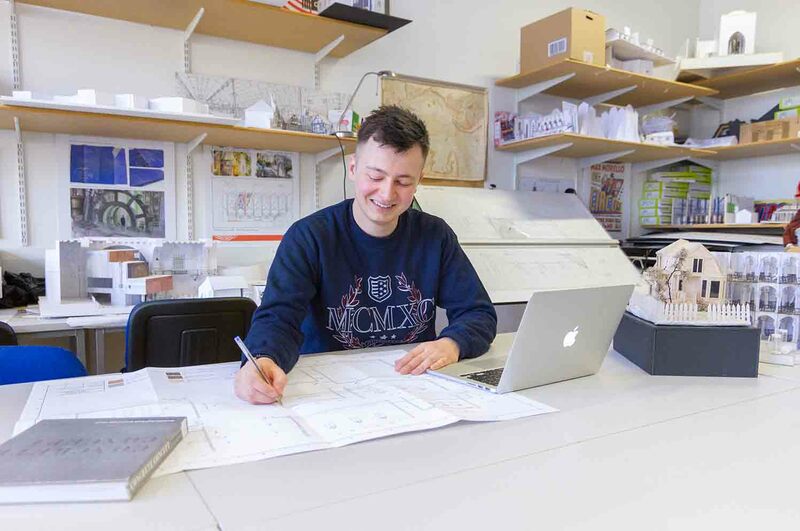 “I would recommend the Design for Film and Television (DFTV) course, as it has not only enhanced my pre-existing skills but has also provided me with new skills such as technical drawing and storyboarding. Through the three years’ worth of the projects completed whilst on the course, you can see huge improvements in everybody’s work. All resources you’d expect and need to complete work are available for you and similarly course tutors and lecturers are always happy to help. In my entire time studying DFTV, I’ve never had a day in which I’ve not been able to speak to a tutor for help with work. Even when a tutor you wish to speak to is not in, they made it very easy to contact them in other ways such as email. Which aspects of the course have you particularly enjoyed? “I’ve loved creating visuals for my projects the most, as it’s always been one of my strongpoints and my favourite part of projects. My background with graphics has helped me to create visuals from a digital 3D model, and then creating renders artwork from that. However, now that my skills have improved with help from tutors and fellow course mates, there isn't anything that I don't enjoy doing in each project. In Year Three, we were able to provide our own briefs for two major projects, and this has been fantastic as I’ve been able to break boundaries of my own imagination. Thanks to projects like this, I now have the skills that allow me to create anything that I wish. What do you like the most about your course at NTU? “The best part of DFTV is completing your work around others who share the same passions as you. In the studio, people are always communicating, bouncing ideas of each other, and helping others. The atmosphere is wonderful and it makes going into university so exciting. As well as this, the tutors see us extremely often and because they know us well they understand our strengths and where improvements can be made. What do you think of the facilities available to you at NTU? “The University offers a variety of facilities. In the studios, we have computers (all with their own scanners), full size drawing boards, printers of many sizes, as well as model making materials – all free to use. As well as this, the building in which DFTV is located provides free laser cutting, 3D printing and photography/filming equipment. Personally, I have found the laser cutting and 3D printing equipment to be invaluable, as it has helped me create models for my projects. As well as this, there is always help with using this machinery, so I've been able to use this facility very efficiently."